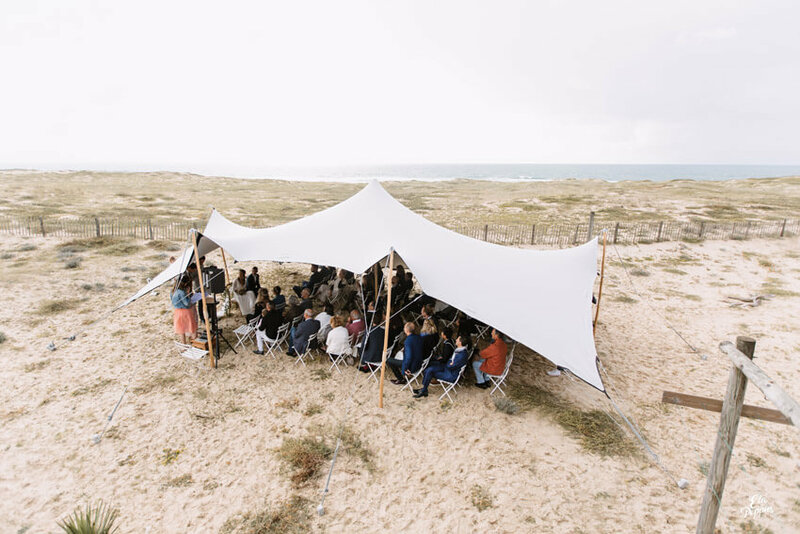 Weddings, seminars and Executive Management Committees at Seignosse Hossegor, Landes. As well as holiday stays, the location of the villa at the foot of the dune with ocean view and its spacious and fully-equipped configuration make it an ideal place for events. Naturéo Lodge welcomes family ceremonies such as weddings and baptisms. It also has an ideal configuration for professional stays and events such as seminars and management committees. What could be more romantic than the beach and ocean as décor for your wedding? What better place than the dune to host a ceremony? The large outdoor terraces and the sitting and dining rooms are suitable for groups, the fully-equipped kitchen ideal for everyone and the ocean-view suite is perfect for a honeymoon! Executive Management Committees, meetings, etc. For seminars and Executive Management Committees and management committees, the lodge has video and computer equipment for your presentations. Ideally located with direct access to the beach and not far from the forest, the villa allows sharing your schedule between meetings and Nature activities that enhance relaxation and exchanges. Ideal for reinforcing team spirit!